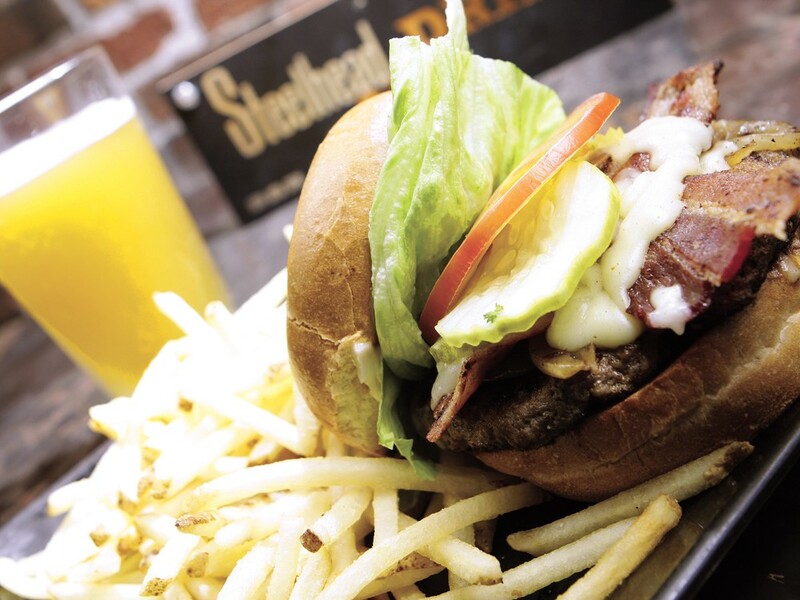 The Steelhead menu is full of adventurous options, but you can always rely on the trusty Steel Burger. It’s not always a bright idea for a restaurant to try to be too many things at once. “Stick with what works” is the philosophy for most eateries. But the opposite could be said for the Steelhead Bar and Grill in the heart of downtown, just a half-block off of Spokane Falls Boulevard. The sleek, clean interior gives the impression of a fine-dining establishment, but the affordable prices, quick service and diverse clientele immediately prove that it’s much more than that. Serving as a popular lunch spot with the downtown office crowd, a well known happy hour purveyor (3 pm to 5:30 pm, Monday-Saturday; 9 pm to close, Monday-Thursday; all day Sunday), as well as a place to grab a classy dinner, the Steelhead has thrived on accommodating an array of patrons. At a recent lunch stop, the taco salad ($9.50) proved fresh, creative and big enough for two. On special was a prosciutto Panini, as savory of a take on a hot sandwich as you’re likely to find. If those don’t sound good, don’t worry, there’s a little something on the menu for everyone.